1) The absolute best reserved seats in the main theatre where all our major guests appear and events and contests occur! These seats are YOURS, come and go, Friday through Sunday. See all the stars up close and personal and this is great for photographers too! You get to pick your actual seats during the ordering process! 2) Complimentary in-person autographs* with great guests including IAN SOMERHALDER, PAUL WESLEY, KAT GRAHAM, STEVEN R. McQUEEN, MICAH PARKER and DANIEL GILLIES. The value of these autographs when the list is completed, if purchased separately, will be $250, so you can see why "Going Gold" is such an outstanding offer. Take advantage of this deal and grab your seats today! 8) Keep your same great seats and enjoy a GOLD EXCLUSIVE ONE HALF HOUR Panel with Ian Somerhalder and Paul Wesley, together on stage!! The guys will also, of course, appear during the day, this is just an extra plus for YOU! 10) The right to renew your same or better seat for next year’s event if applicable. 1) Wonderful reserved seats in the main theatre where all our major guests appear and events and contests occur! These seats are YOURS, come and go, all weekend, all three days. Your seats are either to the rear or sides of the Gold Weekend Package seats. 3) Complimentary in-person autographs with great guests: IAN SOMERHALDER, PAUL WESLEY, KAT GRAHAM and STEVEN R. McQUEEN. The value of these autographs, if bought separately, is $190 which is almost the cost of the entire package, so you know this is great deal! Saturday Evening FOUNDER’S DAY MASQUERADE BALL COCKTAIL PARTY and Centerpiece Contest! Complimentary for our Gold Week­end Patrons. Other tickets are now sold out! This is gonna be one wild party so come “dressed to kill” and get ready to hit the dance floor (or just catch the moves!) A cash bar is available for adults, soft drinks too! A hot DJ keeps the action moving and we will have celebrity guests dropping by including tentatively MICAH PARKER, RICK COSNETT, MATTHEW DAVIS, and PHOEBE TONKIN. Let your creativity shine by entering our famous themed CENTERPIECE CONTEST! Create the very best centerpiece that shows off your love of the Vampire Diaries! The winner takes home a $250 Gift Certificate! All of this takes place at our SATURDAY EVENING FOUND­ER’S DAY MASQUERADE BALL! If you are entering a centerpiece please come up to the front of the line 10 minutes early so we can place you in the room. 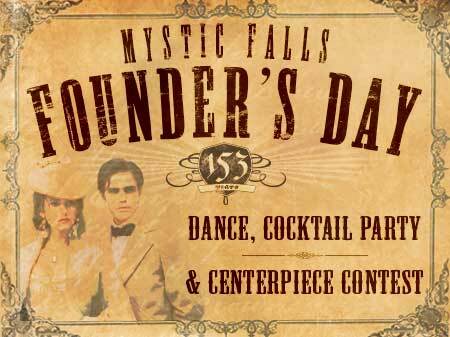 Come dressed to impress in your favorite evening attire, or something themed out from TVD, or just come and relax: your evening will be one to remember! The person most dressed to impress will win a $250 gift certificate!